NeuroChip is a microfluidic electrophysiological device, which can trap the microscopic worm Caenorhadbitis elegans and record the activity of discrete neural circuits in its ‘brain’ - a worm equivalent of the EEG. C. elegans have been enormously important in providing insight into fundamental signalling processes in the nervous system and this device opens the way for a new analysis. Prior to this development, electrophysiological recordings that resolve the activity of excitatory and inhibitory nerve cells in the nervous system of the worm required a high level of technical expertise – single microscopic (1mm long) worms have to be trapped on the end of a glass tube, a microelectrode, in order to make the recording. The worms are very mobile as well as being small and this can be a challenging procedure. 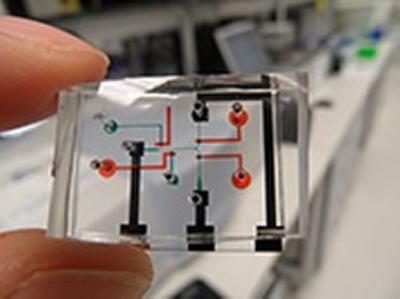 The microfluidic invention consists of a reservoir through which worms can be fed, one after the other, into a narrow fluid-filled channel. The channel tapers at one end and this captures the worm by the front end. The worm is then in the correct orientation for recording the activity of the nervous system in the anterior of its body. The device incorporates metal electrodes, which are connected to an amplifier to make the recording. The design of the trapping channel has been optimised by PhD student Chunxiao Hu, so that the quality of the worm ’EEG’ recording is sufficient to resolve the activity of components of the neural circuit in the worm’s nervous system. This device has been used to detect the effects of drugs and is highly suitable for high throughput screens (which allow researchers to quickly conduct millions of chemical, genetic or pharmacological tests) in neurotoxicology and for generic screening for neuroactive drugs. It has more power to resolve discrete effects on excitatory, inhibitory or modulatory transmission than previously possible with behavioural screens. The research, which is published in the latest issue of the journal PLOS One, is a joint project between the University’s Centre for Biological Sciences and the Hybrid Biodevices Group.